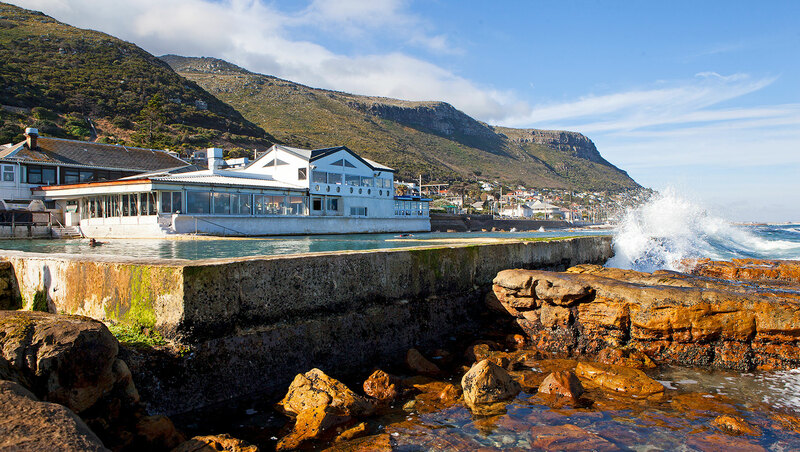 THE BRASS BELL – Brass Bell is located in the heart of the historic fishing village of Kalk Bay, Cape Town. 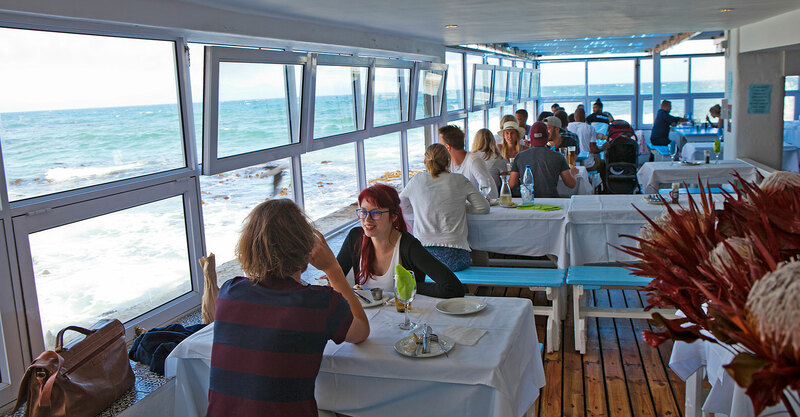 This seaside location not only offers one of the most amazing views in Cape Town but with its 8 different dining locations it definitely caters for all. Surrounded by rolling waves, the restaurant complex of terraced dining areas, pubs and entertainment theatre offers visitors an unforgettable and truly unique dining experience. The Brass Bell Restaurants and Pubs, located in the trendy harbour town of Kalk Bay, is situated in False Bay, one of the most beautiful places on earth. 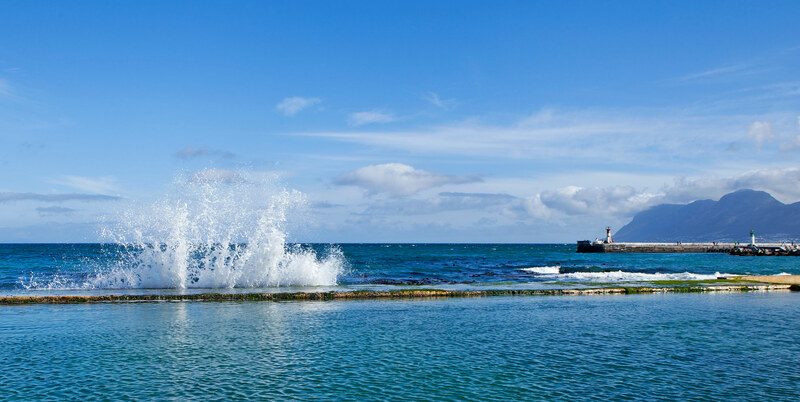 Surrounded by the rolling waves, the restaurant complex of terraced dining areas, is nestled into the tidal pool walls, and offers visitors an unforgettable and truly unique seaside dining experience. Built in 1939, the Brass Bell’s humble beginning as a council-run “Tea Room” is a far cry from the bustling complex of waterfront dining venues that it is today. Brass Bell’s owner, Tony White has pioneered the ongoing development of the Brass Bell Restaurants and Pubs, and together with his dynamic hospitality team, has turned the Brass Bell from a once quaint seaside bistro into a beloved household name, boasting an impressive series of 9 different dining and events venues. The location and splendour of this magical place has captured the imagination and hearts of tourists and locals alike, and it is now a world renowned and well-loved hotspot; welcoming guests with our warm hospitality and superb menu selections. Open 7 days a week for Breakfast from 8.30 to 11.30am. Children's Menu also available. Corkage @ R40. All of our restaurants and pubs offer stunning views across False Bay, Kalk Bay mountains and of course the working Kalk Bay Harbour. 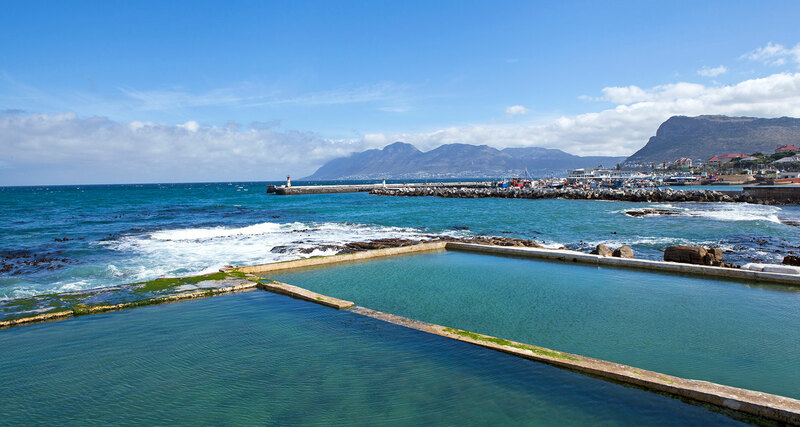 Watch the surfers on the world renowned Kalk Bay Reef, look out on the sparkling Indian Ocean for seals, whales and the fishing boats coming in and out of the bustling harbour with their daily catch. Brass Bell is just as enticing in winter as you find cosy corners with fireplaces and heaters that make you warm and comfortable. This glass encased gazebo seats 50, is non-smoking, and has magnificent panoramic views across False Bay that will take your breath away. Seats 50. The Oyster Deck is outdoors with outstanding views across False Bay and the majestic mountains of Kalk Bay. Watch for surfers tackling the famous Kalk Bay Reef. Seats 60. This dining area is a local favourite, intimate, cosy and relaxed, with a touch of fun! seats 35. If you’re looking for a ‘Cheers’ Bar - where everyone knows your name, in South Africa – you’ve found it in the Cabin Bar! standing room mostly up to 40 comfortably. Unfortunately we do not take table bookings in the Cabin Bar. The Grill room is comfortable, private and inviting with an ‘olde worlde’ charm that seats 60 in a booth style setting. Il Porto is a stylish venue that is so close to the waves that you could be forgiven for thinking you are on a boat! Seats 50. The Beach decks at Brass Bell offer our guests the very best in seaside fun. Twin raised decks under a stylish wooden awning surround the silky white sand centre. With a paddling pool for the under 10’s, this venue promises to be the definitive Summer Lovers’ choice! Seats 150 on each deck. 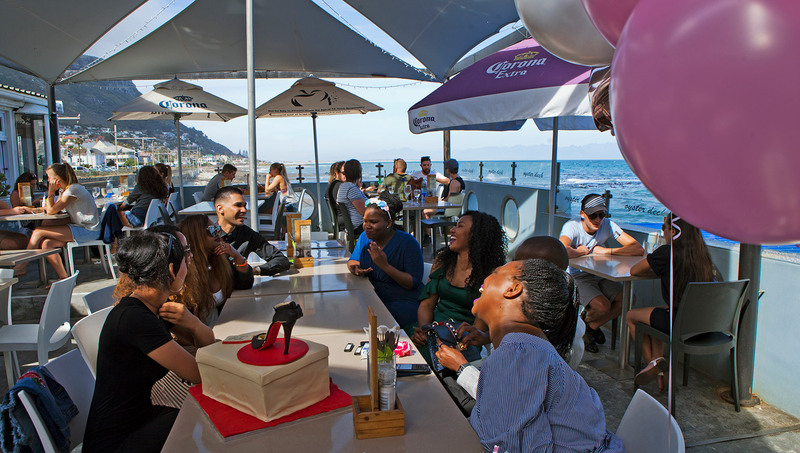 The Bikini Deck is a smoking area which overlooks the two Kalk Bay tidal pools and the Kalk Bay Harbour. The vibrant atmosphere coupled with an ideal location, make this venue a must for fun and memorable experiences. This area is not open to under 18 year olds. Seats 120 seated and 300 for a standing event. Located downstairs and outside with a transparent shade covering, there is no better place to sit and relax, while feeling part of the sun and surf. Built into the sea wall, the deck seating goes right onto the tidal pool edge and offers guests an unforgettable experience right on the water. Seats 70. Brass Bell Restaurant and Pubs is located in the heart of the historic fishing village of Kalk Bay, Cape Town. This seaside location not only offers one of the most amazing views in Cape Town but with its 9 different dining areas, there is something to suit everyone. Please contact us with regards to booking one of our venues for your function or event. Our spacious restaurant is ideally suited for groups and events, special occasions, engagement parties, wedding, corporate functions or even workshops. WELCOME TO YOUR NEW FAVOURITE RESTAURANT AND EVENT VENUE! Why not Uber to the Brass Bell? "The service was friendly and efficient and we felt encouraged to visit again the next night, our last night in Kalk Bay. Again we had a lovely meal. This time we had starters of Mussels and a Greek Salad, followed by T-Bone (again) and fish cakes for me and this time a bottle of Pinotage. The food is excellent value and the location and service is lovely." "Maxwell was our waiter and he was everything and more, attentive and knowledgeable. We had a lovely meal, delicious mussels, some surf and turf with fresh fish and chips paired with T-bone steak. Their guava and rosewater milkshake was a meal in itself, delicious!" "One of my favourite meals in SA. We had fisherman's platters which would feed a small army. Service was great, food was fantastic - particularly the mussels and seafood curry. We also had traditional Cape Town brandy cake for pud - and it was fantastic. The location, right on the sea, gives diners a great view of the waves crashing in." "Most amazing views, lovely food and superb service by Gerry! She truly makes Brass Bell feel like home! "Catered for a lovely birthday brunch, the staff are friendly and the food is very tasty. Love going here with family and friends." "Went for lunch, and two amazing burgers (one veggie). Cheap - around 110rand each and pretty big burgers too. We were lucky enough to watch whales out the window too!" a great view, pay us a visit!